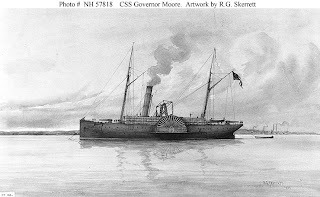 Figure 1: CSS Governor Moore (1862) sepia wash drawing by R.G. Skerrett, 1904, depicting the ship during her brief service as a Confederate cotton-clad gunboat on the lower Mississippi River. Courtesy of the Navy Art Collection, Washington, DC. US Naval Historical Center Photograph. Click on photograph for larger image. 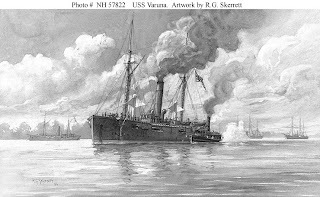 Figure 2: USS Varuna (1862) sepia wash drawing by R.G. Skerrett, 1904. This Union warship was attacked by Governor Moore during the Battle of New Orleans on 24 April 1862. Courtesy of the Navy Art Collection, Washington, DC. US Naval Historical Center Photograph. Click on photograph for larger image. 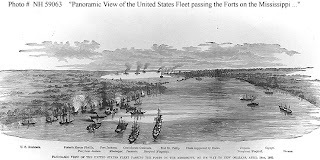 Figure 3: "Panoramic View of the United States Fleet passing the Forts on the Mississippi, on its way to New Orleans, April 19th, 1862." Contemporary line engraving published in The Soldier in our Civil War, Volume I. It depicts the Federal ships shortly before they began the passage of the forts, with the Confederate gunboats waiting upstream. Individual US Navy ships (as identified in text below the engraving) are: John P. Jackson, Mississippi, Pensacola, Hartford (flagship), Iroquois, Westfield, Cayuga, and Varuna. US Naval Historical Center Photograph. Click on photograph for larger image. Figure 4: "The Splendid Naval Triumph on the Mississippi, April 24th, 1862." Colored lithograph, published by Currier & Ives, 1862. It depicts Admiral David Glasgow Farragut's fleet passing Forts Jackson and St. Philip, below New Orleans. Courtesy of the US Navy Art Collection, Washington, DC. US Naval Historical Center Photograph. Click on photograph for larger image. 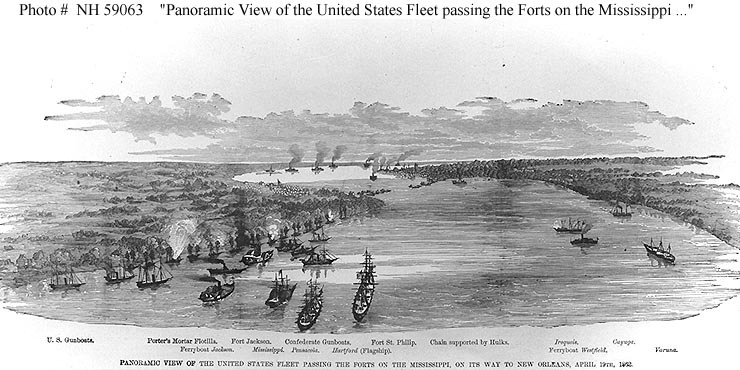 Figure 5: “Farragut's fleet passing Forts Jackson & St. Philip.” Line engraving depicting the battle which took place on the lower Mississippi River during the night of 24 April 1862. A key to the forts and specific US and Confederate ships is given at the bottom of the view. The ships include USS Varuna (in action with Confederate gunboats, with CSS Governor Moore to the left of Varuna), USS Brooklyn, USS Pawnee (which was not present), USS Hartford (Farragut's flagship, with a fire raft alongside), USS Pensacola, USS Mississippi, CSS Louisiana (exploding), CSS Manassas and Federal mortar vessels. US Naval Historical Center Photograph. Click on photograph for larger image. 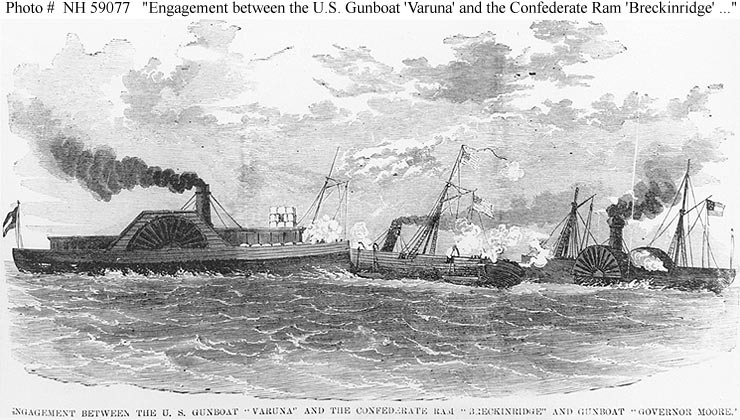 Figure 6: "Engagement between the US Gunboat 'Varuna' and the Confederate Ram 'Breckinridge' and Gunboat 'Governor Moore'." Line engraving published in The Soldier in Our Civil War, Volume I. It depicts USS Varuna in the center, being rammed by a Confederate ship identified as "Breckinridge" (at left) while engaging CSS Governor Moore (at right) during the battle off Forts Jackson and St. Philip, 24 April 1862. The side-wheel steamer identified here as "Breckinridge" (General Breckinridge), is more probably the CSS Stonewall Jackson. US Naval Historical Center Photograph. Click on photograph for larger image. Figure 7: "Fight between the 'Varuna' and the 'Governor Moore'." 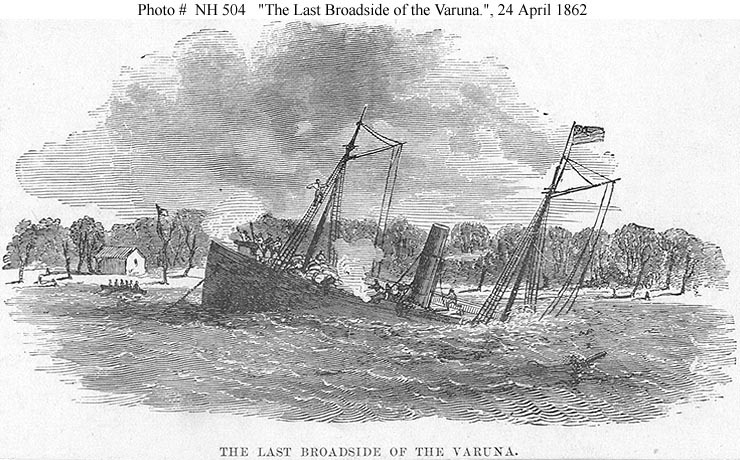 Line engraving published in Harper's Weekly, 1862, depicting USS Varuna sinking at right, after she was rammed by CSS Governor Moore during the battle off Forts Jackson and St. Philip, 24 April 1862. The Governor Moore is shown at left, beached and burning after being severely damaged by the Union fleet. US Naval Historical Center Photograph. Click on photograph for larger image. 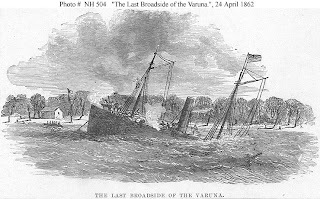 Figure 8: "The Last Broadside of the Varuna." Line engraving, published circa the 1860s, depicting USS Varuna continuing to fire at Confederate forces as she sank, during the Battle of New Orleans off Forts Jackson and St. Philip, just below the city of New Orleans, Louisiana, on 24 April 1862. US Naval Historical Center Photograph. Click on photograph for larger image. The steamer Charles Morgan was built by the Southern S.S. Company at New York City in 1854. She was a schooner-rigged, low pressure, seagoing side-wheel steamer and was seized at New Orleans by Brigadier-General Mansfield Lovell, Confederate States of America (CSA), in January 1862. Charles Morgan was quickly converted into a “cotton-clad” gunboat, so named for all the bales of cotton that were placed on board the ship for protection against Union gunfire. The stem of the ship was reinforced for ramming with two strips of flat railroad iron bolted to her at the waterline. Pine lumber and bales of cotton were also used to protect the ship’s boilers and give some cover to her gun crews. The ship was re-named Governor Moore, after Louisiana’s governor, and was owned by the State of Louisiana and attached to the Confederacy’s Mississippi River Defense Fleet. The 1,215-ton Governor Moore was armed with two 32-pounder cannons and had a crew of 93 officers and men. Governor Moore was placed under the command of Lieutenant Beverly Kennon, Confederate States Navy (CSN), who was a Commander in the Louisiana Provisional Navy without pay. 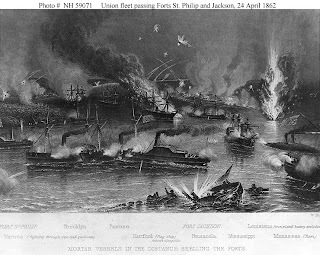 On the evening of 24 April 1862, Union Admiral David Glasgow Farragut began his much anticipated attack on New Orleans. However, before he could take the city, his ships had to pass the Confederate forts that protected New Orleans, Forts Jackson and St. Philip. On that same night, a small group of Confederate gunboats steamed out to meet the powerful Union fleet and Governor Moore was part of that flotilla. As the Union and Confederate warships drew closer and closer, both sides began firing at each other. Governor Moore spotted the Union gunboat USS Varuna and headed straight for it. Since Governor Moore was not heavily armed, all she could do was ram the Union warship. Governor Moore picked up as much speed as possible and slammed into the side of Varuna. She then reversed her engines, backed away from the stricken Varuna, and then rammed the Union warship once again. After hitting Varuna, Lieutenant Kennon, commander of Governor Moore, was unable to depress his guns far enough to fire on the Union vessel. Kennon ordered one of his guns to shoot through his own bow and used the resulting hole as a gun port to fire more shots at Varuna. At approximately the same time, another Confederate cotton-clad warship, CSS Stonewall Jackson, also rammed into Varuna. By now Varuna was fatally damaged and beginning to sink. But the tough Union gunboat continued firing at her tormentors until rising water from within the sinking ship silenced her guns and the ship sank. 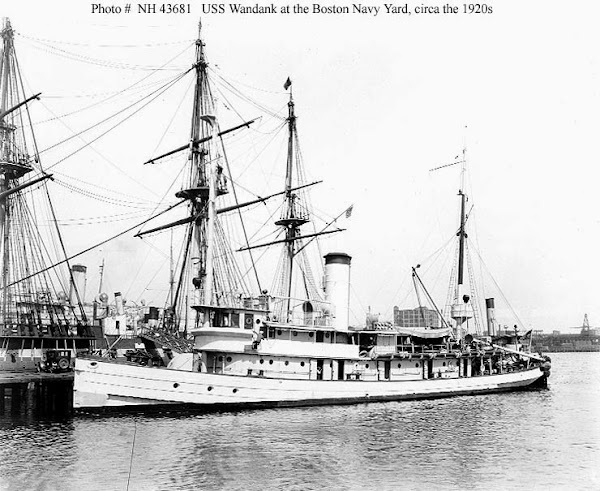 After her battle with Varuna, Governor Moore tried to attack another Union gunboat, USS Cayuga. But in doing so, Governor Moore exposed herself to fire from most of the Union fleet. 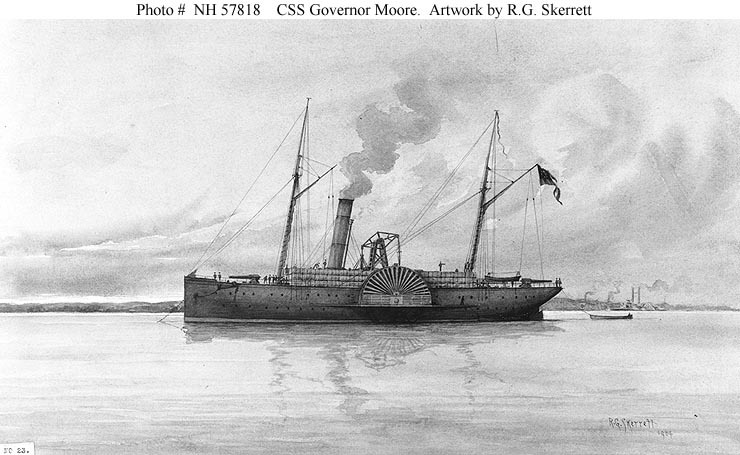 Governor Moore was pounded by numerous hits and practically the entire upper part of the ship was blown to pieces. The ship was taking on water and approximately 64 men lay dead or dying on board the Confederate gunboat. Incredibly, Lieutenant Kennon was still alive and with the help of his pilot and another seaman was able to ground the ship as it sank. The three men then set the ship on fire to prevent her from being captured by the Union fleet. The burning Governor Moore eventually blew up and sank, taking most of her crew with her. Lieutenant Kennon and several surviving crewmen were later captured and imprisoned on board the Union warship USS Colorado. What the Confederate Navy lacked in warships it tried to make up in sheer bravery and audacity. Unfortunately, that usually isn’t enough to defeat a much more powerful fleet. Governor Moore made a valiant effort to try and stop Farragut’s warships. 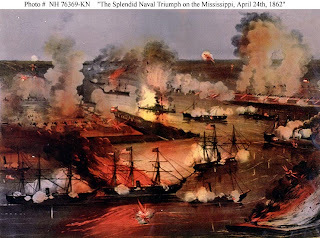 But the Union fleet was just too strong and too large that night for Governor Moore to change the outcome of the battle, which turned out to be a tremendous Union victory.